Why Animals always run,jump but not rest? "Want to be a little smarter? Have a better memory? Stay mentally sharp? Improve higher brain function? Run. Those who exercise have a mental advantage over those who don't. "...exercisers showed significant improvements in the higher mental processes of memory and in "executive functions" that involve planning, organization, and the ability to mentally juggle different intellectual tasks at the same time. "What we found so fascinating was that exercise had its beneficial effect in specific areas of cognitive function that are rooted in the frontal and prefrontal regions of the brain." The brain-boosting (and prevention of brain decline) effects of physical exercise have been studied nearly to death. The confusing part is why so many humans do not exercise. And this is where we can learn from our pets. Take a healthy dog and put it in a confined area (house, kennel, etc.). Then take him out to a park or trail, and remove the leash. What happens? 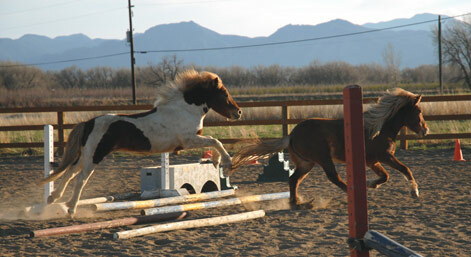 Take a horse out of a stall or small paddock and turn him loose in a larger enclosure (what we call "turning out"). What happens? The photos on this page are an example of what my horses do every single day. Take a human out of his work cubicle or off the couch and turn him loose outside. What happens? Hmmm... for far too many of us, nothing happens. Or we turn around and walk right back in the door and head for the couch or the chair in front of our computer. The one thing that usually does not happen is the kind of physical exuberance--the sheer joy of being able to run and jump--that so many other animals do. Where did we lose that overpowering desire to run and jump? 2) Horses don't run for cardio health, weight loss, brain fitness, blood pressure, or anything else but the love of moving. I'm not sure how to regain that. I run several times a week, but not because it feels good to DO it, but because it feels good to HAVE DONE it. It's the post-run experience I'm looking for, where I can stop for that double latte on the way home with less guilt, and where I have more energy for the rest of the day. It's for later that night, when I always sleep a little better on the days I run.Read More. "the Goldberg Variations, probably the most singularly unified, most spiritually esoteric work created during the Baroque. In this intimate keyboard work, consisting of a theme, 30 variations, and a reprise of the theme, worlds of numerical, religious, and metaphysical symbolism have been found. The Goldberg Variations is a work of almost unbelievable substance, a whole infinitely greater than its 32 constituent parts." More. Check this one.Here.And Google trend too.Here.